Dubai Airports’ efforts to reduce its carbon footprint delivered energy savings of 5.17 million kilowatts per hour (kWh) in 2016 across Dubai International (DXB) and Dubai World Central (DWC) – the equivalent to powering 235 homes for a full year, the operator has revealed. The report was issued just ahead of Dubai Airports’ participation in the Earth Hour on March 25 – when all non-essential lights across both DXB and DWC switched off for one hour. The energy savings are the result of a range of initiatives including the installation of new and efficient systems, active participation in events such as Earth Hour and World Clean Up Day, as well as new projects including the installation of solar panels on the Concourse D building that began operation with the opening of the new facility in February 2016. “In line with the long-term goals of [the] aviation industry, the Airports Council International and ICAO (International Civil Aviation Organisation), Dubai Airports' vision is to ultimately attain carbon-neutral growth. Our achievements in 2016 represent an important step in that direction,” said Michael Ibbitson, executive vice president of technology & infrastructure at Dubai Airports. A large proportion of total savings resulted from the replacement of traditional lighting with LEDs for street lighting, signage and the airfield, as well as the installation of intelligent occupancy sensors at DWC and DXB. The optimisation of chiller plants at both airports with the installation of energy-saving variable frequency drives for pumps and automation for demand-based flow also helped energy conservation efforts during the year. 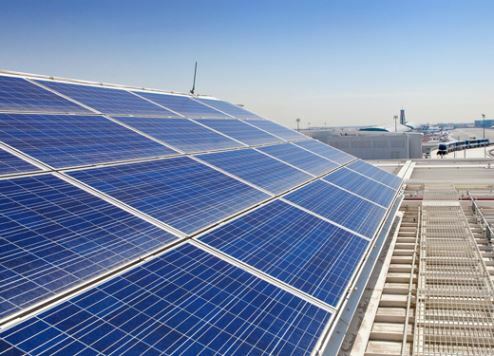 The solar panels installed on the roof of Concourse D at DXB and at the Police facility at DWC also made significant contribution to Dubai Airports’ energy conservation efforts by generating power. DXB and DWC became the first airports in the GCC states and two of 56 internationally to achieve Level 2 accreditation from the ACI’s Airport Carbon Accreditation Programme in 2016.